Looking for more amazing movies like Tomb Raider? We’ve got you covered! If you’re craving action, adventure, and even a little mystical mystery, here are 10 fabulous movies to add to your watch list! Last week we covered the best Tomb Raider movie quotes as well as the casting news. This week we will dive into the movies that are similar. RELATED: read all the best The Predator movie quotes & trivia? Tomb Raider is an action-adventure movie, based on the 2013 video game- Tomb Raider. The movie is a reboot of the 2003 movie- Lara Croft Tomb Raider: The Cradle of Life and the 2001 movie- Lara Croft: Tomb Raider. The movie is due to hit theaters on March 16, 2018. In the mean time, here are some other great movies like Tomb Raider to check out! Affiliate links included below. If you make a purchase through these links, we earn a small commission at no extra charge to you! The Mummy Returns is a 2001 action-adventure, fantasy movie that is the sequel to the 1999- The Mummy and the prequel to the 2008- The Mummy: Tomb of the Dragon Emperor. Imhotep’s mummified body is sent to a London museum, where he is resurrected and begins his reign of terror. The movie stars Brendan Fraser, Rachel Weisz, Arnold Vosloo and John Hannah. Be sure to check our Mummy Returns movie quotes. The Scorpion King is a 2002 action-adventure, fantasy movie that is a spin-off from The Mummy movie franchise. It tells the story of Mathayus and his rise to power as The Scorpion King . The movie stars Dwayne Johnson, Steven Brand and Kelly Hu. National Treasure is one of my favorite movies like Tomb Raider! The 2004 action-adventure, heist movie is the prequel to the 2007- National Treasure: Book of Secrets. Benjamin Franklin Gates, a cryptologist, historian and treasure hunter, tries to locate the legendary Templar Treasure before his ruthless adversary, Ian Howe. The movie stars Nicolas Cage and Sean Bean. The Librarian: Quest for the Spear is a 2004 action-adventure, comedy movie that is the prequel to the 2006- The Librarian: Return to King Solomon’s Mines and the 2008- The Librarian: Curse of the Judas Chalice. Flynn Carsen, a student who has 22 college degrees, gets a job at a mysterious library and soon finds himself on some mission hunting relics. The movie starts Noah Wyle. Sahara is a 2005 action-adventure, comedy movie that is based on the 1992 book- of the same name- by Clive Cussler. Dirk Pitt, a renowned adventurer, tries to help Dr. Eva Rojas, who is being chased by a ruthless dictator, while also searching for a missing Civil War battleship. The movie stars Matthew McConaughey, Steve Zahn and Penelope Cruz. Live Free or Die Hard is a 2007 action-adventure, thriller movie that is the sequel to the 1988- Die Hard, the 1990- Die Hard 2, the 1995- Die Hard with a Vengeance and the prequel to the 2013- A Good Day to Die Hard. John McClane, a police detective and Matthew Farrell, a young hacker, team up to try and take down Thomas Gabriel, a master cyber terrorist. The movie stars Bruce Willis, Justin Long and Timothy Olyphant. You can’t talk about movies like Tomb Raider without mentioning the original adventurous archaeologist! Indiana Jones and the Kingdom of the Crystal Skull is a 2008 action-adventure, fantasy movie that is the sequel to the 1981- Raiders of the Lost Ark, the 1984- Temple of Doom and the 1989- The Last Crusade. Dr. Henry “Indiana” Jones, a famous adventurer and archaeologist, goes to battle with a group of Soviet agents, while looking for a telepathic crystal skull. The Mummy: Tomb of the Dragon Emperor 2008 action-adventure, fantasy movie that is the sequel to the 1999- The Mummy and the 2001- The Mummy Returns. Rick and Evy O’Connell’s son, Alex O’Connell, digs up the mummified body of the Emperor of Qin. The movie stars Brendan Fraser, Maria Bello and Luke Ford. Prince of Persia: The Sands of Time is a 2010 action-adventure, fantasy movie that is based on the 2003 video game, of the same name. Dastan, a fugitive prince and Tamina, a young princess, team up to try and stop Nizam, an evil villain who is planning to destroy the world. The movie stars Jake Gyllenhaal, Gemma Arterton and Ben Kingsley. Hercules is a 2014 action-adventure, fantasy movie that is based on the 2008 novel- Hercules: The Thracian Wars- by Steve Moore. Hercules, the son of Zeus, helps Cotys, the King of Thrace and Ergenia, the daughter of Cotys, to defeat Rhesus, a tyrannical warlord. The movie stars Dwayne Johnson, John Hurt, Rebecca Ferguson and Tobias Santelmann. Along with these movies like Tomb Raider, you could always watch the original movies as well! Then you can compare them when you see the 2018 version! I’m looking forward to doing that! 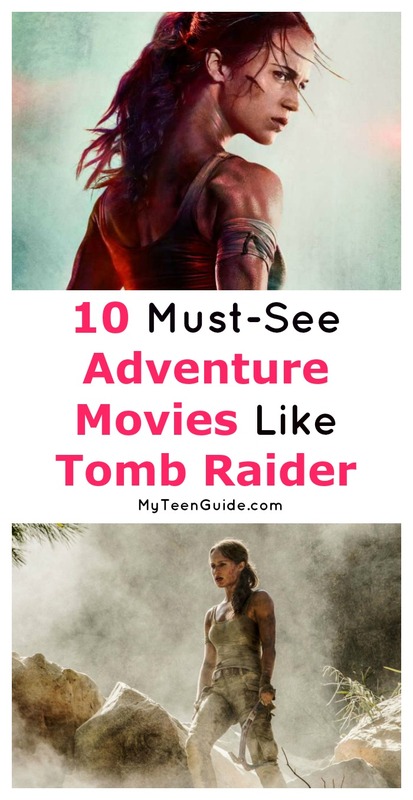 Have you seen any of these movies like Tomb Raider? Which are your favorites? Tell me below!